Have You Thought About Dying? 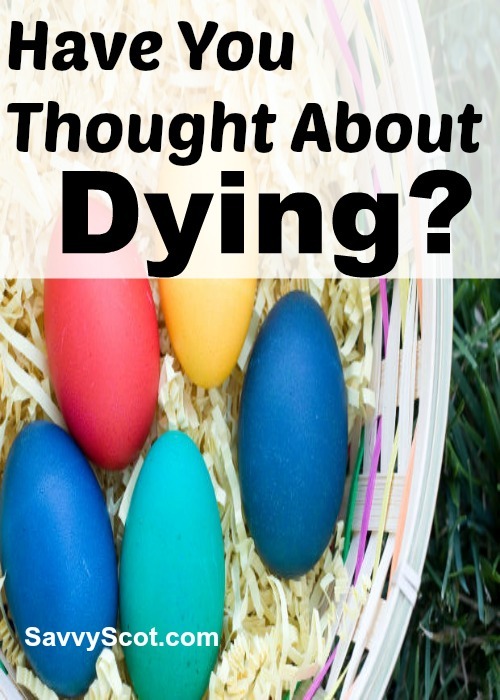 Dying is not something people ever like to think about. We associate dying with something that happens when you are old and have fulfilled your dreams. While we appreciate that in certain circumstances or career choices, dying is more possible, most of us don’t think it will happen to us until a lot later on in life. I appreciate that a soldier fighting a war, or an extreme sports professional may realise that death is actually not that uncommon, however the majority of us perceive this as extremely unlikely. This line of thinking is actually quite irrational. Everyday we read tragic stories in the news about people losing their lives in car accidents or being murdered; Do you think they woke up expecting to die? If you are like me, you will have a financial plan in place for your family / future family. You will no doubt have thought about paying off your mortgage, the importance of savings and how you are going to put your children through college, save for retirement and never have to want for anything. Your emergency fund will provide a buffer for the unexpected – a contingency fund for the unknown; the washing machine that blows up, the central heating system that packs in or the freezer that no longer keeps things cold. Being the responsible financial planner that you are, it won’t be too much of a problem when the car needs new brakes and tyres in the same service. All of this is great, but it has one massive dependency…. That you continue to live! What if you were to drop down dead tomorrow? Sure, we have all heard that expression, but take a minute to imagine looking down on your family and (apart from the obvious) how this would change their lives. Is your partner on enough money that they could solely take care of your dependents? Could your partner afford to pay the same mortgage, car repayments etc.? Would you feel guilty for changing their lives and then forcing them to change it again? Life insurance is not something that I ever used to think of as being important. After all, why should I? I am only 24 years old… statistically speaking I have at least another 50 years to go – I am not even a third of the way through my time on earth and you want me to think about dying? Surely that is an extremely pessimistic outlook? I have asked you all a lot of questions in this post; questions that you need to ask yourself seriously. Questions that you need to ask yourself and search for the answers and implement any necessary changes. I am very fortunate that my job offers life insurance as part of the benefits package. In the unfortunate event of my death (not only would SavvyScot cease to exist) but my wife would get a payout of 3x my annual salary, in addition to future pension entitlement. It is quite reassuring to know that this money could pay of the balance of our mortgage and give Mrs Scot some stability. Furthermore, as my circumstances change later in life and we eventually start a family, I am safe in the knowledge that my policy will increase in value – in direct correlation to my salary. The purpose of this post is not to give out advice on certain life insurance policies or features, but rather to prompt you all to think about your own situation, put a plan in place and then forget about it again! Nice post sir. I think a lot of us view ourselves as indestructible and don’t think about these things. Having a family has really made me mindful of this and do what I can to make sure they’re provided for if I keel over tomorrow. On a separate note, I encourageyou to read my post on Monday as it’s somewhat related to your’s. John S @ Frugal Rules recently posted..Frugal Friday: Posts That Ruled This Week, the Election is Over Edition! I thought about dying just yesterday! Because there was an earthquake in Guatemala and we thought what if the Mayans are really training for the end of the world. That was a desperate case so I said I wanted a gun to end my days in case I survived, I don’t want to starve and agonize for weeks. Anyway, out of topic. I don’t have kids or hubby yet so no life insurance, but I have made a will and my niece would have quite a nice net worth for a 2 yo! Pauline recently posted..Friday recap, plugged in, hammock hung! It’s so hard to truly think about dying and planning your life (and actions) with that thought in mind. My wife and I made it a goal to write up a will and get a few other things in place, so hopefully we’ll get that done in the next few months! Jason recently posted..Go Green! Save Money! 🙂 At least you only have to do it once then update it now and again! I’ve thought about dying, our pastor wouldn’t marry us without a will so we took care of that at the tender age of 23. As for insurance, my hubby gets 3X my salary if I go, but we havn’t insured him because of his drug history it would cost over 5X the average cost. We used to have some insurance in the event of his death, but it was so pricey that once our net worth exceeded 500,000 we decided to cut it. My life would be greatly inconvenienced with his passing, but we could still maintain our quality of life, and Derek would be quick to add that I’d still be able to treat my date to dinner, because a single mom of 3 would have to spring for dinner. He’s so hilarious! I like the sound of what your pastor did. It’s a shame that it’s not a legal requirement actually! I work at a mortuary so I think about dying waaaaaaay too much. But, its inevitable and there is nothing that anyone can do about it. We might as well be prepared. True dat! Do you find that you are less scared of death due to your job? I haven’t considered getting it yet because I’m not married and have no dependents. I pretty much have no debt of any kind. The only thing I’ve done is a will and instructions if I’m on life support type of thing. My accountant did suggest get long term disability insurance though. I haven’t done it yet, but should. Budget & the Beach recently posted..Link Love 11/9/12-Happy 100th Post! From a financial perspective, if you take out a policy while your young it will normally cost you a small amount. Anywhere from £4 to £20 per month will get you from £100k to £500k of cover depending on health and personal circumstance. If you take a policy on a level term guaranteed premium, this cost will never change – every month for the entire policy you will pay the same premium for the same level of cover regardless of you getting older or health conditions you may develop! If you wait until you are older to take out a policy, you could end up paying £100 per month for just a £100k of cover! Therefore doing it now, could literally save you thousands of pounds over your life time. Sounds like disability insurance could be good to cover yourself. If you have no dependents etc. then I can’t see a need for life insurance either. Nice cheery topic! I have thought about it, enough to have lots of life insurance and who would take care of my daughter if my husband and I both were to go at the same time. Worrying about money or custody during a horrible time would be even worse. My work retirement fund forces us to contribute to a life insurance policy. If I die my wife will receive $700,000. I’m not 100% sure how that figure is calculated, but I know it has something to do with the amount of income you bring home. That sounds like a very decent sum of cash – Heaven forbid anything happens – but if it did, at least you know your family are taken care of! The fact that I know one day I will day gives me the drive to chase my dreams. Life is short and could end at anytime. So I can’t afford to take the chance of putting my dreams on the backburner. I make my dreams my reality! If savvy scott ceased to exist I would be heart broken! Very profound… I like it!